A day for tires and rain. In India, I've been getting my news and weather from the internet. 123india.com was more optimistic than yahoo.com which forecast up to 1/2 inch of rain. I had sprinkling warm rain for most of the ride, but 123india.com was still closer. It was briefly dry as I left. The road got progressively busier as I got closer to Thiruvananthapuram (Trivandrum) at 15 km. Fortunately, also a bit flatter today. I rode past airport and then through middle of Trivandrum. For most part it was busy and built up all along the route. I saw my first accident. A truck was parked along the road. A second truck and a car coming from opposite directions decided to go through the gap at the same time. Crunch! Fortunately, mostly fenders. Rode even more carefully after that. Larger town at Attingal. Police officers are frequently found watching the traffic at major intersections and one was here. It became calmer as I passed a turnoff to Varkala at 60 km. Supposedly similar to Kovalam with beach hotels mostly for foreigners. After this, more towns and it started getting busier as I came into Kollam. At 82 km I heard a hiss as my rear tire went flat. A good chance to swap out my other tire with a bulge. Previously when I rode on very smooth roads (i.e. rarely), I could feel the bulge once per revolution. Now I have a good tire again and hope it lasts me the rest of February. Came into the busy city center, found a hotel and got out of the rain. Nearby is a nice three story shopping plaza with many shops and also an internet cafe. Also booked a boat trip for the next 80 km to Alappuzha. 85 km today, 27371 km cumulative. Today a peaceful tourist cruise along backwaters of Kerala. A guide came to pick up two others and myself from the hotel. They rode in an auto rickshaw and I followed behind on bicycle. We quickly rode down to dock and the boat. It was a 20m boat with upper and lower deck and a canopy above for the sun. Chairs above for about thirty tourists. I took luggage off my bike and all was loaded up front. A small outboard pushed us along at about 15 km/h. It was a nice peaceful eight hour ride through lakes and smaller canals. We passed fishermen casting nets out and also many tall cantilevers with nets attached. We passed by small villages and children yelling, "please give me one pen". One tourist tossed a pen. It landed in the water, though nobody retrieved it. The water looked dirty with occasional debris. However, also some areas with many jellyfish. Signs of lots of fish or at least fishermen. Also saw cormorants, ducks and sea eagles along the way. We made a lunch stop at restaurant built along the water for tourists. Had a nice thali meal. There was a brief afternoon stop at the Matha Amrishtanandamayi Mission at Amrithapuri. This is headquarters of Sri Sri Amrithanandamayi Devi, an important female guru. Tourists said she was known worldwide. Met a cycle tourist from Canada who also started riding in Chennai. He got off at Amrithapuri along with several other tourists. Most tourists were European, but also a few Indian and one couple from US. An afternoon tea stop and then we sailed the last distance to Alappuzha, arriving a little after dark. Nice variation from riding. Let a tout take me to a nearby guest house and found this internet cafe where last of this report is typed in the dark as power has gone off. The UPS is still on hopefully will keep computer and net up long enough to send this off. 1 km today (and 86 km by boat), 27372 km cumulative. Today a shorter ride and then nice exploration of Kochi. The multi-religious aspect of Kerala (and India) is apparent today as I came past more Christian Churches, signs for the Jewish section and synagogue, a mosque and a few temples. Yesterday on the boat cruise, we passed a Buddhist statue. A nice friendly breakfast at the guest house and a wave as I left. Cycled along a canal in Alappuzha before turning north again. Flat for the entire day. A good road and at 25 km, it became a divided road with two lanes marked on each side. At 45 km was a road junction. One side said, "bypass" and another "Kochi 15 km". Took the Kochi road and up the peninsula on which Fort Cochin is at the tip. This road was much bumpier. The first 7 km wasn't too hard to follow, but after that several turns and suddenly I was in a maze of streets. I took my best guesses and sometimes asked for Santa Cruz Bascilica... mostly because that had enough syllables that it might be harder to misunderstand. Sometimes on busy streets and sometimes on quiet residential streets, but eventually found myself at a guest house listed on the more local map. After finding a room and asking a price, I typically indicate I'd like to take my bicycle to the room. This sometimes gets a "crazy tourist" look (particularly on the third floor) but until today had always been allowed. No worries!, I just went to the next guest house. It had two luxuries (toilet and hot water, but no air conditioning which also seems to correspond to less mosquitoes) and a very nice location. Fort Cochin on tip of this peninsula has a nice feel to it, particularly walking rather than navigating by bicycle. Chinese cantilever nets were being used. It took four men to lift the nets from the water and then there would typically be half a dozen fish. Nearby stalls were available to cook up the fish. St Francis Church was built in 1503 and is the oldest European built church in India. It has interesting interior and nice but simple stain glass window. Also here was Santa Cruz Bascilica, a giant church that was otherwise closed. A wedding was at a smaller church right next door. 60 km today, 27432 km cumulative. A tougher ride today. It wasn't the distance (85 km) or the terrain (flat), but instead the road made for tough riding. Except for a gap between 60-75 km, it was very rough and bumpy. Also fairly narrow and for the most part fair amount of traffic. In two sections, for several km they were busy digging a trench next to the road. The dirt was piled up onto the road making it a lane and a half at best. Left Kochi on the ferry (1 Rs) across to Vypeen Island directly north of Fort Cochin. The busy part of the city is supposed to be Ernakulam to the east, so I was hoping to avoid city congestion. This mostly worked, though the road was barely wide enough for two buses to pass each other...	this meant when a bus would come barreling down the road with horns tooting, I would need to quickly check to see if I needed to get off the road. These buses were quite frequent, so it was slow going on and off the road. After 20 km, I came to road intersection and left turn back towards NH 17 highway. Over a low bridge and then at 24 km, I was heading north again. The national highway wasn't much better as far as texture nor width, and with a bit more traffic, so still slow riding. In one part they were busy digging up a trench beside the road and placing dirt on the highway. Slowly came through busier parts of Kodungallor and then not much later it became a toll road. It still came past small towns. At 60 km, nice and smooth. Hooray! Unfortunately, this only lasted until 75 km. As I got closer to Chavaakkad at 80 km, started looking for place to stay. Asked a few times and was directed in conflicting ways before finding myself to Guruvayur at 85 km. It took four tries before I found a hotel with vacancy. They wouldn't let me bring the bicycle to the room, so in the end took everything off, locked it to a tree and hope for the best (they have security guard 24 hours). Guruvayur is an important pilgrimage site with several important temples (Hindus only so no tourists). There is a surprisingly large number of hotels. It looks like this must be lucky place to get married, since several signs for marriage halls. A large ritual bathing pool and large covered awning where pilgrims were resting in the shade. India seems to have all the basic infrastructure in place: electricity, roads, networks, etc. What seems interesting is how variable these systems all are. Rolling blackouts and other power interruptions seem frequent as I've come along. Some of the roads have been just excellent, and some surprisingly bad... no definite pattern, but interesting to see the contrasts. 85 km today, 27517 km cumulative. Interesting to walk around Guruvayur last night. Seems like I was the only non-Indian tourist, rest were there for the temple. Vendors would watch me walk down the street, but I had no aggressive hustle at all. Almost strange. Seems like I've now seen a spectrum in these temple towns with Madurai both holy and touristy with many many aggressive people on the street and Guruvayur on the opposite end. Kanyakumari is somewhere in between. Kovalam is in a different axis since this is even more non-Indians but then also not a temple town. Had a tough ride today. Fortunately the road became smoother at 24 km when I rejoined NH 17. However close to the same point, the hills kicked in. Lots of grades to climb and descend. The clouds from past few days were less, so also lots of hot sun. It was still cool, flat and bumpy leaving Guruvayur. They really do use elephants here, particularly with the temple festivals. This sometimes required careful cycling to avoid elephant poo on the road. A few quick turns and then started following signs to Kozhikode (pronounced with an "r" for "zh"), and also asking people. After 10 km some gentle hills and then kept increasing after that. Multiple busy town centers to come through. After 24 km, Edappal and a smoother road. At 36 km saw an accident. Two trucks smashed and one tipped over. Rest of traffic was mostly trying to find way around. Crossed a broad bridge over Pulantod River and then a sequence of climbs and descents. It was tiring and hot. At 65 km was Kottakkal and I almost stopped there, but looked like only a few hotels along the road, so not too exciting to stop. I was getting pretty tired and stopped numerous times for Fanta, Coke, water and a banana. I walked a hill or two, but mostly trudged along. At 96 km, bought club soda accidentally instead of mineral water. Oh well. From here it started to get busier and also fortunately flatter the last bit into Kozhikode. I felt surprisingly tired. At 98 km, some sharp cramps in my leg. Hmm... Made my way last bit into Kozhikode, brought stuff to my room and collapsed by a fan feeling very tired. A short bit later, went to the restaurant to refuel. I had barely ordered when I felt very sick. Rushed back to my room and threw up. Felt painful cramps again all over, but particularly in the legs. I asked them to bring my food/water via room service. Slowly felt a bit better though still tired. The hypochondriac in me gets out "Healthy Travel in Asia" and starts looking up symptoms... Hopefully similar to heat stroke, though Dengue fever and scary stuff seems to have similar symptoms. In any case, next step for both is to get some rest and see how things feel tomorrow. Hence, I expect to take a rest day tomorrow here in Kozhikode to make certain all is ok.
Now a request for any readers who might be familiar with the India transport network. Today was only 110 km with the hills and heat. Crossing back via Kannur to Hunsor is at least 125 km and crossings of the Ghats from Kozhikode or Mangalore are even longer. Given today's exhaustion, I think it is safer to take alternate transport from Mangalore to Bangalore: plane, train, bus. All three are available here (Kozhikode) and all three are available in Mangalore as well as the potential for finding private car/taxi. Given my (bulky) bicycle and outsider status, any recommendations on which of these modes will be least hassle with a bicycle and my stuff? Send me email if you have suggestions/input. 110 km today, 27627 km cumulative. Felt better today after resting. Surprising how quick I felt sick yesterday afternoon and then just as quickly felt better. A sigh of relief. Otherwise a quiet day in Kozhikode. I changed money at the bank, walked through shopping streets, read and watched TV. Downtown Kozhikode has some narrow streets with many shops and also good bakery close to me. Met Bill Weir (http://www.arizonahandbook.com), another cyclist staying in same hotel and heading southbound. Nice to trade some information. Based on that conversation will likely try heading overland from here via Kalpetta to Mysore. From other email (thanks Shaji! ), looks like it could have some substantial climbs, so will just need to take it slow. Hopefully the hills will be a little cooler. Also have found a nearby hotel with breakfast buffet, so hopefully a bit more nourishment to start than just a few pieces of toast. Last night a lot of chanting and demonstrations outside my window. The government workers are about to go on strike (tomorrow), so not certain if this was why, but in any case they stopped by 8 pm or so. 0 km today, 27627 km cumulative. I "cheated" today and got a ride for 24 km in back of a truck. Normally I'm quite motivated to avoid taking a ride (after all, if the intent was only to get from point A to B, there would be a lot of alternatives that took less physical effort on my part). However, I also resonate with a comment made by Darryl in Geraldton, WA who noted that he saw a surprising number of unhappy cyclists at his shop. Seemed strange to both of us, since if you aren't having fun, then why cycle, perhaps time to slow down. Anyways hitching seemed like the right thing to do to get over top of the Ghats. Otherwise feeling better from riding and seems like I'm in a cooler place. (Also thanks to those with suggestions on alternate transport, I think I've got it now for a while. 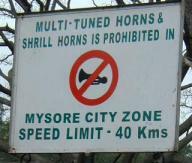 I expect to slowly go via Mysore and then Bangalore taking a day or two in each place). It was still pretty quiet as I rode through Kozhikode. I used my normal technique of writing a set of destinations (Kalpetta and Mysore) on a slip of paper and asking at intersections for directions. After 2.5 km northbound, I got onto NH212 and headed inland. It was a pleasant ride, somewhat bumpy and with moderate grades up and down. However also somewhat cloudy and cooler. Traffic was initially busy and then the road came through a sequence of small towns along the road. A surprising number of friendly people. I got frequent shouts of "Hello", "Hi", "How are you" and generally friendly waves. I stopped a few times to refuel on water or soft drinks and typically had several curious onlookers. There were a few mosques along the way. This area and area from Guruvayur to Kozhikode appear to have larger Moslem population than further south. As I got to Adivarum at 45 km, I stopped in for longer break to eat some biscuits and drink water. I knew from email (thanks Shaji) that the big hill started here, so wanted to refuel. From here, I slowly started riding and also some walking up the hill. There were some sunny hot spots, but also some cooler places. Several monkeys along the way. It slowly got steeper, so took it easy and walked for a while. A truck came by and offered a ride. No thanks. I did however ask several passing motorcyclists "how long to top of the hill?" and generally got "20 km" back each time I asked. There were a set of hairpin turns as the road became steeper. After about 5 km of a slow slog up the hill, decided I would "cheat" and see if I could at least get a ride to top of the hill, particularly if it might be another 15 km walk to the top. Almost immediately another truck came by and offered. Thanks! We slowly rode up on the winding road, horn occasionally blaring when we came to a narrow spot or when passing a slower vehicle. At some points monkeys were beside the road eagerly waiting for handouts. The top was at 57 km, so really only 12 km of climb...oh well. The driver was going to Kalpetta, so let him ride the last distance into town. Some nice views from the top and then a fairly quick change in landscape. I could see tea plants and coffee. The road was back to gentle ups and downs. This seemed like a resort area with multiple hotels out of town along the way. Got to Kalpetta in early afternoon and driver dropped me off at a reasonable hotel. I brought out my wallet and offered "for petrol". He said "no". I offered again and then gave up. Hitching a ride was cheating though still better than wiping myself out again. Seems like the elevation makes it a little cooler and drier here, so that should help in next days. Kalpetta otherwise appears to be a bit of a "string town", with most of the establishments along one road. A bit smaller though still with a good selection of shops, lodging, etc. 50 km today (+ 24 km in truck), 27667 km cumulative. A peaceful though rather bumpy ride today. I crossed the border to Karnataka and thus have now ridden in three Indian states. Heavy overcast and almost cool as I started. First three km were along town of Kalpetta before a road junction I took to the right. Some gentle grades all day. The road was bumpy and so I rode slowly. People seemed friendly as ever, several times I was stopped to answer their questions. A question that came up a few times was "are you alone?" Seemed strange though I think I traveled through some more risky areas with wild animals (tigers, elephants) and potentially also bandits (Veerappan), and so not necessarily recommended for solo travel. Ignorance is bliss. As I was getting close to Sultans Battery at 24 km, one person on motorbike stopped me, asked customary "what nationality" question and then mentioned that there was an American living at Sultans Battery and suggested I visit him. While I didn't intend to make this visit, I also suspected in a small town like this I could probably find him just by asking enough people. The road continued rather bumpy, though also quiet without much traffic. At 33 km was a nice "Cool Bar" and good excuse to get more cold liquids. From here the settlements gradually stopped and I came through Wynad Nature Reserve. Unfortunately the road worsened even more. At 37 km was one of several checkpoints with bars across the road, this one for sales tax collection. A brief 0.5 km stretch of smooth road and then bumpy again. At 45 km was border to Karnataka. Wow, smooth road returns! I then came into Bandipur National Park with signs for elephants and tigers. I saw two deer but no other large mammals. It was peaceful and quiet with no people and only very occasional traffic. Trees along the way with gentle grades. My smooth road didn't last. At 55 km the road narrowed enough that I had to get off for each (infrequent) truck and bus. At 61 km this narrow road suddenly became extremely bumpy again. Sigh. It was still a peaceful ride though at less than half the speed of before. The road only slightly improved as I came into Gundlupet. Instead I walked downtown. Found another bar and restaurant that seemed a bit better. Still no menu, so with assistance of another patron who knew some English, made an order. I ended up with fried rice, chicken, cucumber and mineral water. This wasn't what I thought I ordered, but was delicious anyways. Found a good sweet shop on my way back. 80 km today, 27747 km cumulative. A shorter ride today through Karnataka. The first 33 km almost to Nanjangud were still bumpy roads and so it felt wonderful to ride on smooth roads the last 25 km. Had dosa and tea for breakfast (15 Rs) and was on the road. There were a few larger villages along the way, but not many little places. The soil looked dry without much in way of crops. Initially the entire road was bumpy, but after 12 km, there was a middle strip of concrete slightly smoother. So I rode in the middle until a vehicle came and then off to the shoulder. Some gentle rolling hills along the way. At 34 km was Nanjangud. It was a larger town though the road seemed to bypass a crowded city center. After this, smooth and wide road again, hooray! It got busier as I neared Mysore. I came past a large temple/palace and then to a big traffic circle. It took a bit to navigate Mysore. I initially ended up riding south of the palace and then over to the west. Eventually I saw a street listed on the Lonely Planet local map and then oriented myself. Found a nice hotel where the hot water is not same temperature as the cold, and close to palace and booked for two nights. After lunch walked around the city. I seem to be close to the hardware and household district though clothing and shoes appear to be close as well. A little touristy since a Mirinda was 25 Rs! (normally ~10 Rs). I booked an all day Mysore local sights tour for tomorrow. From my initial reconnaissance, this feels like a comfortable city and so might spend two rest days here before coming to Bangalore (arriving there on the 13th). In evening saw an interesting procession with large pavilion on a truck. 58 km today, 27805 km cumulative. Today a city tour of Mysore highlights as well as nearby Srirangapatna. A bus trip was a good way to see highlights even if the bus wasn't built on my size. Fortunately we had frequent and long stops. This trip started with a pickup at the hotel at 8:30am. From here we went to Sri Jayachamarajendra Art Gallery in Jaganmohan Palace. It had a number of fine oil paintings, musical instruments, carvings, etc. Impressive to see the succession of rulers in Mysore dating from 1399 to 1974. Outside are little shops that sell silk, sandalwood, etc. Mysore is known for both silk and sandalwood and we next headed for a silk emporium for shopping. Nice silk shirts seem to be ~500 Rs and elsewhere cotton shirts for ~100 Rs. We visited the Mysore Zoo. It had a good collection of large mammals, some birds and other animals. Otherwise it was nice walking through the trees and park grounds. I was impressed by sizes of the tigers, and hyenas. A group of Indians had me pose with them for a photo... in front of the giraffes. The bus climbed 12 km up Chamundi Hill with nice view and an important temple. Apparently pilgrims climb more than 1000 steps up the hill. Here was a large collection of vendors with carts. The temple was crowded with long line, so walked around and looked at the view. On the way down, we stopped at a large nandi (bull) statue. Next stop, Mysore Palace. This magnificent palace was built between 1897 and 1912 when the old wooden palace burned (for cost of ~4 million Rs). Wow! It was amazing to see the splendor of the stained glass, large expansive halls, wall paintings and other palace areas. Seemed to particularly contrast with some of the rural and poor areas in the surroundings. Large crowds slowly walked through the viewable areas. Unfortunately also a large number of aggressive sellers, beggars and hustlers including a huckster at the "Free Camera Storage" desk that extorted 10 Rs as "donation". A brief stop at St.	Philomenas Cathedral, the third largest church in India and then a ride in late afternoon to Srirangapatnam. Srirangapatnam was seat of government where Hyder Ali and his son Tipu Sultan ruled much of south India in the 1700s. Here was Gumbaz, the tomb of Hyder Ali and Tipu. We drove the bus through the large fort and stopped at the Sri Rangantha Temple. This temple is dedicated to Vishnu. For the evening, we drove to Brindavan Gardens to see these large illuminated gardens. The site is at base of a long dam. I walked 1.5 km along the dam, down through the gardens for another 1.5 km and then slowly back 3 km again. Lots of cascading water being lit up along the way and a large pool in middle as well. This and a crowd numbering thousands made for a very impressive sight. Finally our bus ride back to the hotel and 9 pm return. It was end to a long day but nice sightseeing. Overall I was most impressed by Brindavan Gardens and Mysore Palace and particularly their size and scale. 0 km today, 27805 km cumulative.